you can’t take the kid out of class but you can take the class out of the kid | you seem nice. since you’ve last checked in, i’ve had a few highlights. i done did babysit saturday night (4/9)! here’s the thing with these stinkers. they’re sneaky. the 3 year-old attempted to put me in a choke hold. why? just because! she thought it would be hilarious. she laughed and ran off. 30 minutes later she told me it was time for dessert. she wanted, no, NEEDED dessert. elena/tiny terror: yes, you do! like candy. me: like what? what’s candy? t.terror: can-dy…can-dy…can-dy…CAN-DY. CAN-DY. CAN-DY. CANDY CANDY CANDY CANDY CANDY CANDY CANDY CANDY…!!!!!!! i was surprised at her technique. she started off slow, then just let it all out. in between the can-dy & CAN-DY, i was trying to explain how i didn’t think they had candy. t.terror overhears this useful information between her demands, screams with delight and runs to the kitchen and clings/hangs from the counter. yep, i took a pic. she looks innocent. until the shrills hit your ears. she thought i tricked her into taking vitamins. homegrrl’s definitely 3. i tried telling her that they weren’t vitamins and i didn’t trick her but she wasn’t havin it. 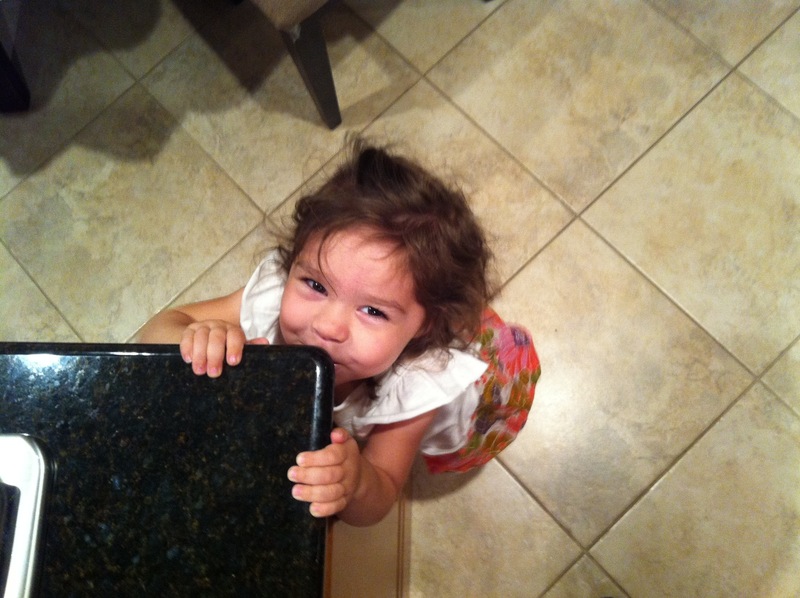 so she peaced out of the kitchen. and another thing. they don’t understand sarcasm. like, at all. i’m pretty sure the 7 year-old thinks i’m an idiot. and come to find out, he dislikes go diego go, because it’s unrealistic and something about the animals. i don’t even remember. i just verified that he was actually 7 and said yeah, ok, build your lego commercial airplane and don’t throw a fit if you lose some pieces. after that first HOUR. (yep, all within ONE HOUR. i wish that was a joke.) everything was fine and dandy until bedtime when they informed/showed me that the t.terror learned to escape her crib/bed a la pint-sized punk. they ran into the living room giddy, laughing about how they weren’t in bed. ya know, being preschool rebels. i spent 45 minutes coaxing them back into their rooms using a few threats to get them to stay on the physical mattress. anywho. tuesday (4/12), after my cousin’s confirmation, my brother and i were on our way back home when a song came on the radio. this song spurred some crazy dance sways and head bobs from the driver aka the brother. what song was it? yep. keri hilson’s pretty girl rock. surprised? me freakin too! it was pretty funny. i would describe the confirmation shindig but nothing crazy happened. i think that’s because it was a formal event in the catholic realm. i think we did avert a serious situation by staying away from the archbishop post-ceremony, so my cousin/brother/aunt/uncle/i wouldn’t be an embarrassment to the family or the catholic church…good decisions made by all. now, on to what i’ve been learning in class. ha, but seriously, this stuff is pretty entertaining. wednesday (4/13), we were discussing lifestyles and how advertisements are best when they advertise a lifestyle rather than a product. so we had to share what our lifetsyles are. the pinup classmate said that people think she’s a hipster and if she was in the hipster category, she was gonna take christine and me with her. hipster lifestyle. pffHA. so the hipster style somehow evolved into hipster memes. so we shared a few. here’s my fave! 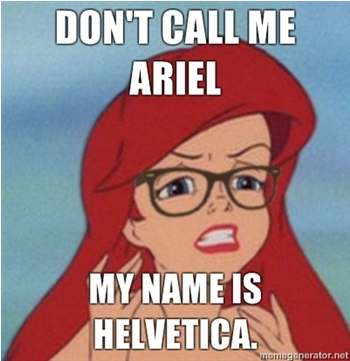 hipster little mermaid. my faaave! i think it's because it's half design humor, too. 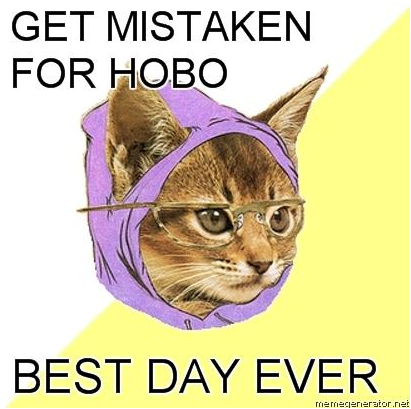 we also brought up hipster kitty. haha i dont know why i find this so funny. but i do. 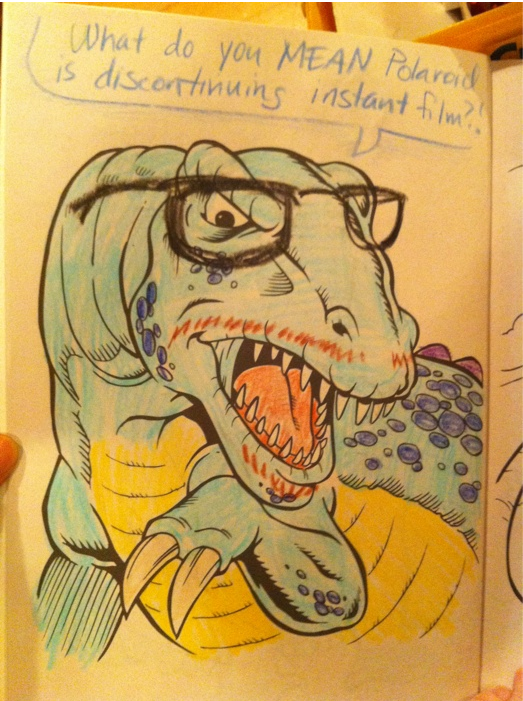 which just reminded me of hipster dinosaur coloring books. its ok hipster dinosaur, i was sad, too. and i’m done with hipster memes. here’s an actual ad we watched that demonstrates the selling of a lifestyle and it’s pretty sweet. not gonna lie. this class discussion somehow transitioned into crafts & hobbies and i dubbed that night the best class time ever. and now, it’s t-minus 3 weeks! wut wut. bring on the headaches, coffee, and trees reincarnated into research papers! yaaay…recycling…wooo. happy beginning of the end of the semester.